Do they even make station wagons anymore? It seems to me it’s the perfect family vehicle – well, perfect if you aren’t concerned about ‘safety’ for children, but back in my childhood, seatbelts were optional and we liked it that way. In fact, if memory serves, the seat belts in the back seat were always buried in the crack. Anyway, I loved our station wagon. We would do a cross-country trek once a year to visit both sets of grandparents, and the back of the wagon was prime riding real estate. It would hold the cooler (so you could sneak snacks), and I could stretch out on a blanket or sleeping bag and either read or look upside-down at the sky. Good thing I didn’t get carsick. or thrown from the vehicle. The “way-back”, as we called it, was a nice place. I liked looking upside-down at the sky at night. Then I could “push” the screw heads around the window like they were buttons and pretend to be an astronaut. Do kids pretend to be astronauts anymore these days? I remember making a tent in the back of our car. We’d put each end of a bedspread in the windows. Of course that was on trips when it wasn’t hot out. We didn’t have air conditioning in our car when I was a real little kid, so in the summer the windows would be down. Our family owned a huge blue Impala. My brother and I would lay our sleeping bags across the entire length of the back seat and then spread out. We’d lay length-wise and hope that we didn’t push the other off onto the floor. Good times. We were not allowed to ride in the way back. I did sleep on the floor in the backseat on my back with my legs over the hump. We started using seat belts when I was in 5th grade so that was the end of that. 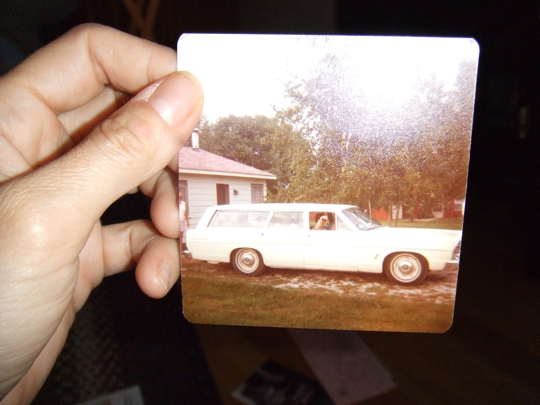 We also had a station wagon -- a caprise classic. We had a seat in the way back -- we used it for long trips and put all the luggage in a car top carrier. It was sweet. We actually have a station wagon now, along with many other German families, but with strict regulations no one rides in the “way back.” Too bad -- kids today are really missing out. Ford Country Squire. It was awesome, until Dad totaled it on the freeway, caught up in a mass pileup on black ice. He was OK, except for some cuts and bruises. Your picture reminds me of http://dearphotograph.com/ , a site you might enjoy. *gasp* I love that! Thank you!